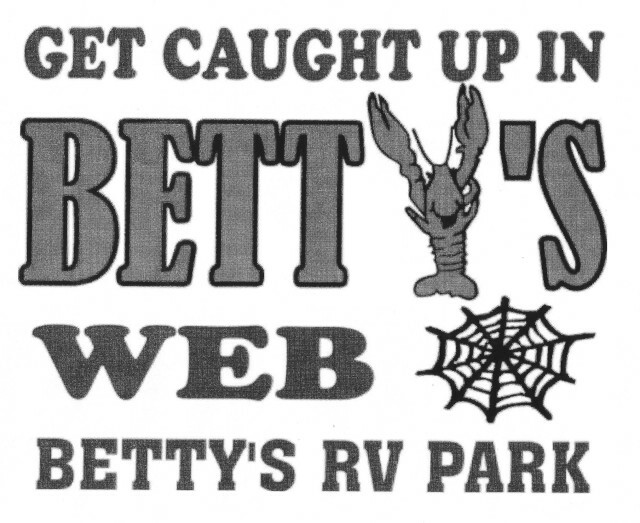 Betty's RV Park – Get caught up in Betty's web! Get caught up in Betty's web! Selected as the “Most Fun Small Private RV Park” in the United States. A small, unique, intimate & modem-friendly RV park located in the heart of Cajun Country. It’s like a B&B experience. Private campground located in the heart of Cajun Country/onsite manager. Convenient location to visit many area attractions. Park is 20 min. from Lafayette; 90 min. from Baton Rouge; and 150 min. from New Orleans. Free WI-FI access for RVers. “Betty’s Louisiana Room”. An enclosed room where RVers can enjoy covered dish meals and gatherings in a comfortable setting. Covered Pavilion area for gatherings and Happy Hours, including picnic tables, swings, barbeque pit, and equipped with water and electricity.